Responsive and Multipurpose WordPress themes with modern design are very flexible for all devices. Premium themes are more easily to customize with immense possibilities. All themes are 100% responsive, each element, shortcode, slider and fully responsive, you can disable/enable responsive mode from the theme options. Multi-purpose responsive design themes are best suited for magazine websites, blog websites, and users who want to showcase their work on a neat portfolio site. Retina ready is great in high-resolution devices like iPad, iPhone, Mackbook, iMac most of the themes are retina ready so don’t worry about the future. If you want a better response to their web page a great idea is to invest in a quality Premium WordPress theme rather than opt for the standard free themes on WordPress. Today i would share fresh premium responsive design, retina ready, multi-purpose WordPress themes with you, which are best to use your next WordPress website. ACE is a clean, super flexible, fully responsive and retina ready WordPress theme. Modern and clean design can be used for any type of website: business, corporate, creative portfolio, blog, products, ecommerce, magazine etc. You can build your own or use one of 20 predefined skins. You can modify layout, styling, colors and fonts directly from within the backend. Capital is a brand new theme based off the new framework we developed for Dynamo and comes pack with the goodness you see there. Capital comes with a super-powerful slider with nearly 15 different layout options. You can upload custom backgrounds to each slider, add a unique background color to each slider, it gives you ability to show videos or images, there are 5 different layouts and the ability to add a call to action button to each slide. Fresh is an awesome WordPress theme which brings many useful and most popular functions with clean & unique design. It’s ideal for any personal or corporate portfolio. It’s very flexible and powered with Bootstrap that has advanced theme options to make your site very flexible and fully customizable. Spectro is clean, responsive and flexible modern looking WordPress theme. Thanks to multi-purpose layout it can be easily used for business, corporate or portfolio sites. Theme was created with beginners in mind, so all the options, shortcodes, custom templates and post types are easy to use and user friendly. Theme was heavily tested on mobile devices to make sure it looks good and it’s fully flexible. Felius is a cross browser compatible, retina ready, responsive WordPress theme with clean design that suitable for wide variety of websites. Tons of Customizations are possible with this theme that’ll help you redefine your website’s brand value. Evolux is Responsive Multipurpose WordPress Theme with Attractive clean-wide design, the perfect solution to show off your product or Information. It can be awesome to use for corporate website, portfolio, blog and anything you need. 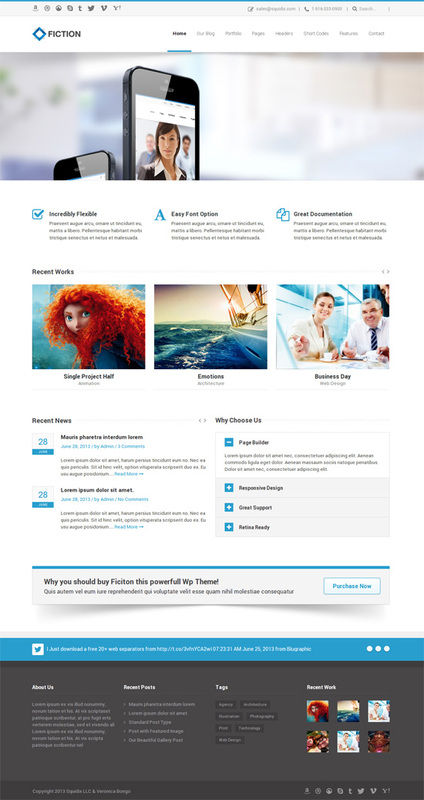 Fiction is a powerful WordPress theme developed with a focus on flexibility. Virtually everything about Fiction is customizable – from colors to fonts to page templates. Iguana is a Responsive Multipurpose WordPress Theme. Can be successfully used for corporate site, blog site, portfolio and many more. . It’s created by using the latest HTML5 and CSS3 techniques in accordance with the latest WordPress Coding Standards. Fits all popular mobile devices and tablets. Dreamer is a fully configurable and easy to use one page parallax template with a lot of great features. It has been specifically designed to be easily customized and it’s created for creatives who want to make portfolio in few minutes. Appdev is a perfect one page theme for mobile app developers to showcase their work. Built on top of the a clean, modular framework, Appdev has multitude of features that you can leverage to to build a site to act as a launchpad for iPhone, iPad (iOS) or Android apps. The author did a thorough study of requirements of app developers by studying scores of actual app showcase sites, themes etc. Lots of hours of hard work has gone into this theme to make it THE theme that any app developer/marketer would want to use.